Starts the feature by Beverley Golden. 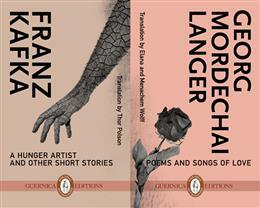 With Guernica’s flip book and dual translation A Hunger Artist and Other Stories; Poems and Songs of Love, it’s easy to get captivated by the well-known Kafka. But, in this case, one of the most fascinating aspects of the book, Golden points out, is the story of Kafka’s friend Langer. Langer, who, unlike his friend, is anything but a household name and whose poetry, up until very recently, you almost couldn’t find at all. In a world where so many books and so much information is available online, it’s hard to imagine a book truly hard to find. But Elana Wolff’s search almost ended empty-handed. The book was not available online, or in libraries. She couldn’t even find a copy in rare bookstores in Tel Aviv, and the only glimmer of hope -The Hebrew University in Jerusalem, had a copy in storage that Wolff was warned could take almost a week to locate. They also warned her that in such a case, it was likely that they might not be able to find the book at all. In her feature on the book, Beverly Golden takes us on that journey to uncover Langer’s lost book of poetry from the moment Elana Wolff first reads brief mentions of the poet, right up to the moment where she finally gets to hold the book in her hands. Tagged with A Huger Artist and Other Stories; Poems and Songs of Love, Elana Wolff, Kafka, Langer, Menachem Wolff, Poetry, The Huffington Post, Thor Polson.